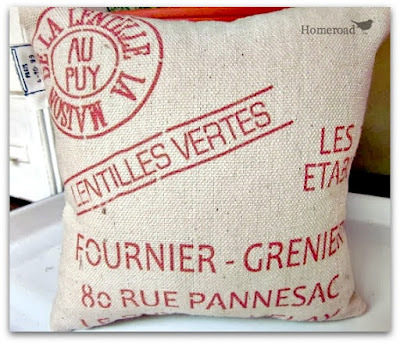 This post is my early Spring garden in progress. Daily things are quickly growing as the temperatures here climb to the 80's this week. 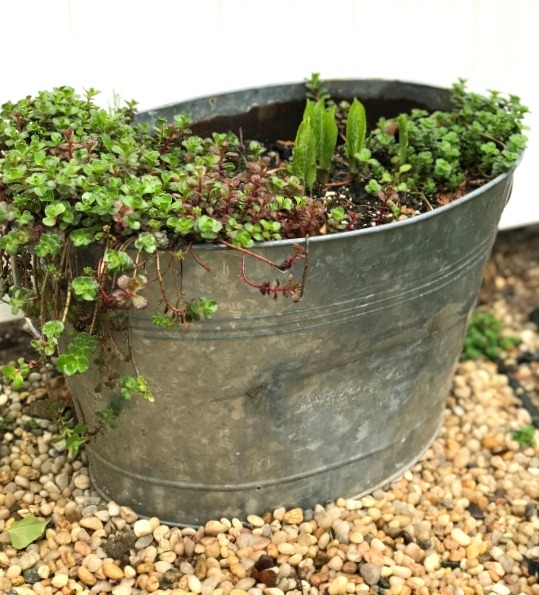 One of my favorite planters is a vintage galvanized tub. Inside the tub is a rusty funnel that holds Hens and Chicks to keep them separate from the other plants. Here's how pretty it looked filled with flowers last year. We had a very cold Spring on the East Coast and things are moving along a little slowly this year. 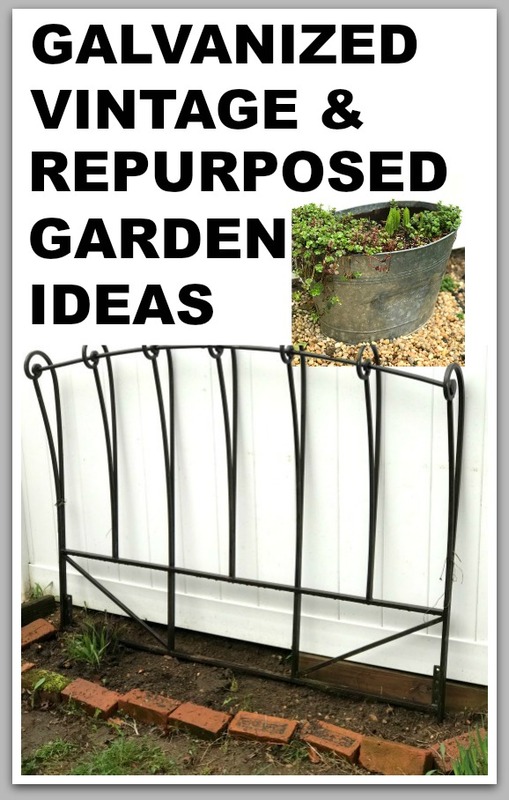 I use a lot of galvanized steel for planters in my yard. 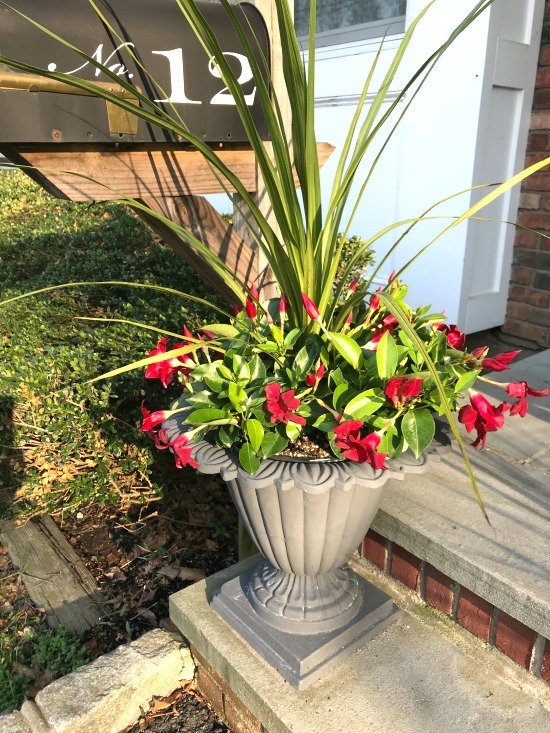 Some of these planters have been out all winter and perennials are just beginning to come back. 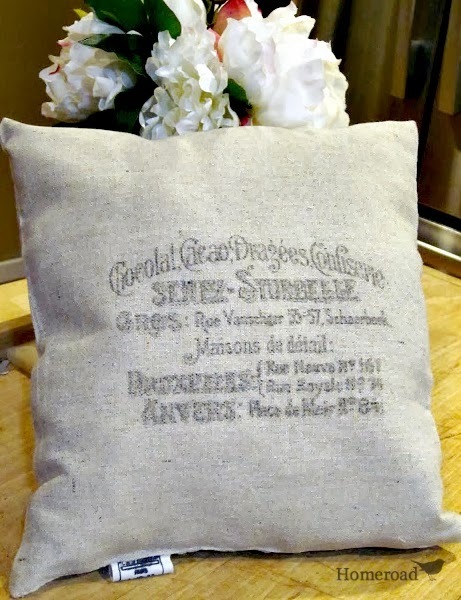 If you're interested in giving your shiny galvanized steel a rustic and aged look, take a look at how it can be done. 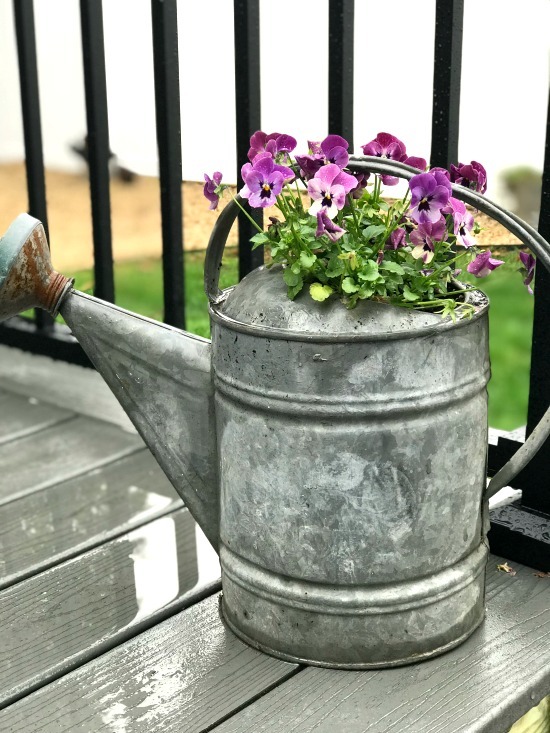 I also love the look of galvanized watering cans filled with flowers. 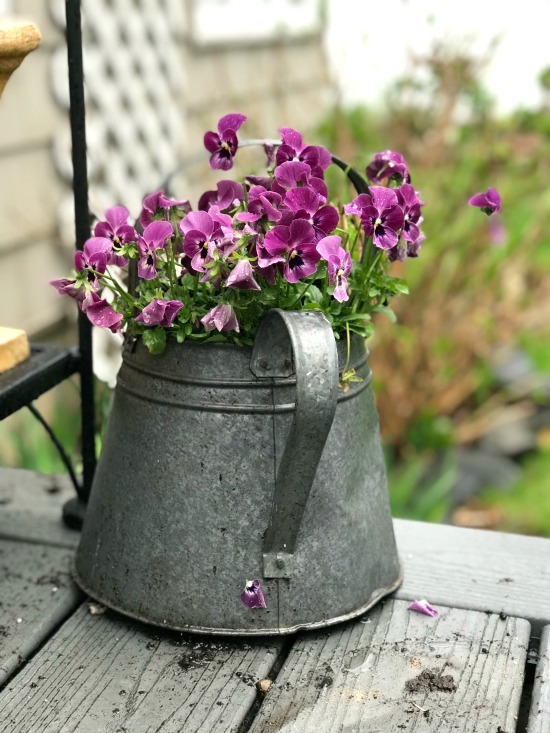 They look so beautiful filled with these purple pansies. 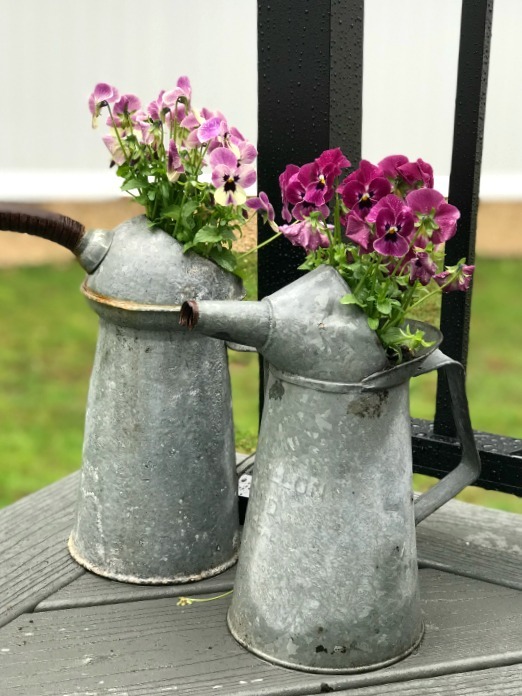 A couple of oil cans rescued from my Grandfather's garage many years ago also make great planters. 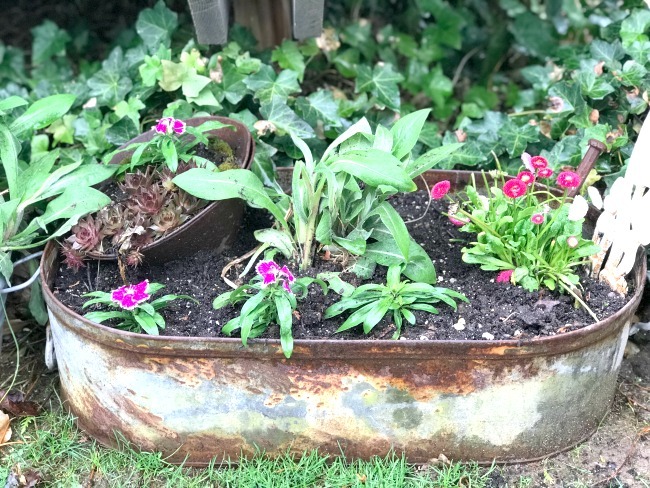 When I use a traditional planter I always like to add a little rusty interest. 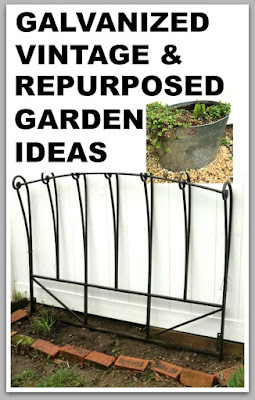 This old spring can act as a trellis for climbing plants. 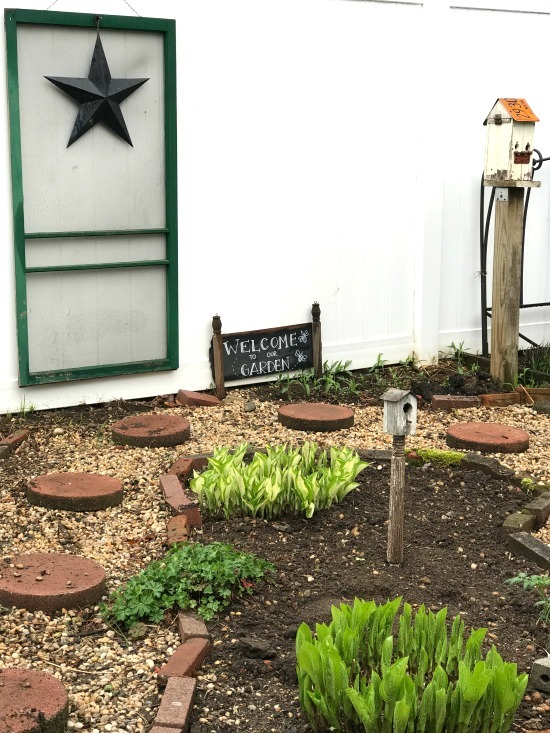 Repurposed items in my perennial garden add interest like this green vintage screen door and a rusty windmill that I actually found on the side of the road. 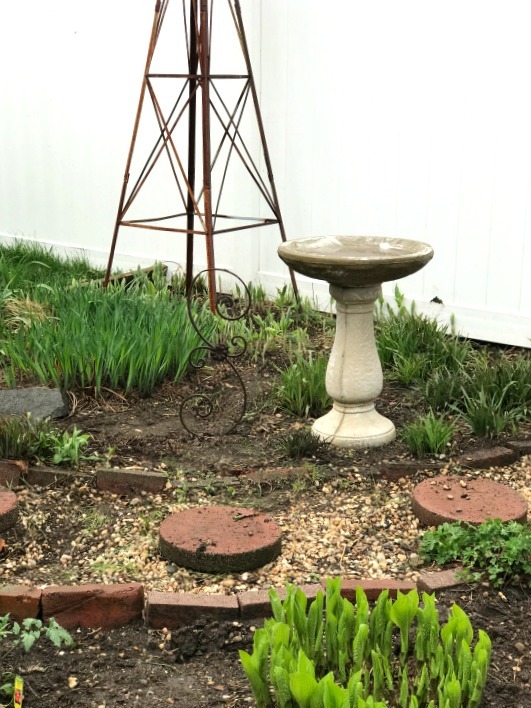 This garden is definitely a work in progress as I work to add more plants as the old ones begin to grow. 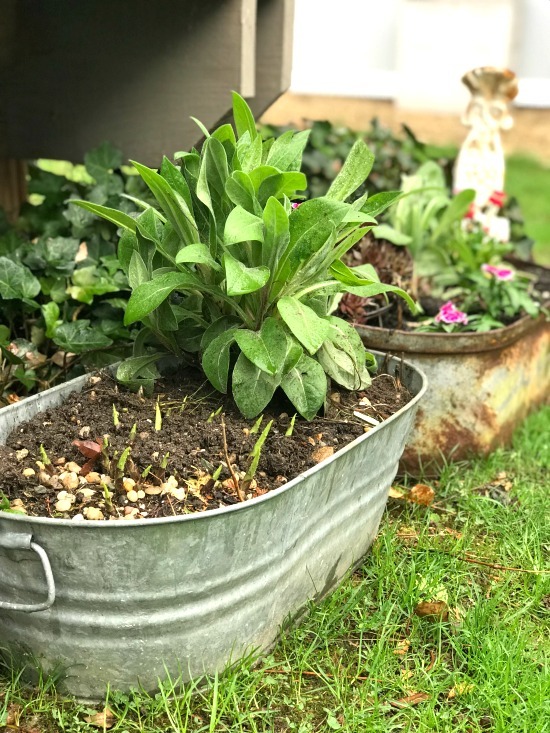 You can read about how to create DIY garden signs and the license plate birdhouse by clicking these links. I have plans to add more pea gravel to the path once the plants begin to fill in. Every year Old Man Winter takes a beating on this garden. 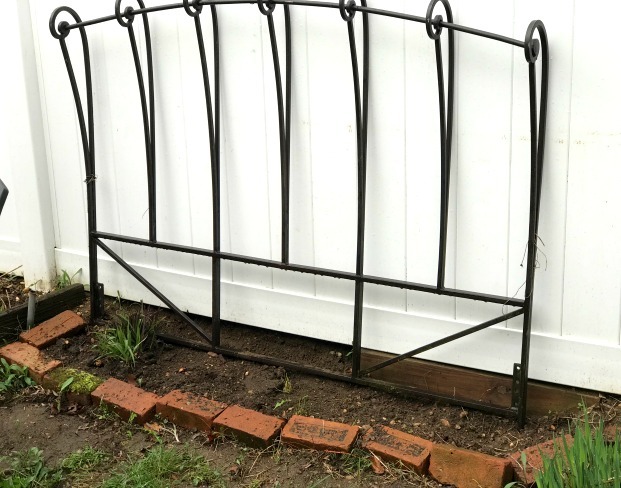 The old headboard from my bedroom isn't going to waste, I repurposed it and once the Morning Glories climb up the rails it will be beautiful. 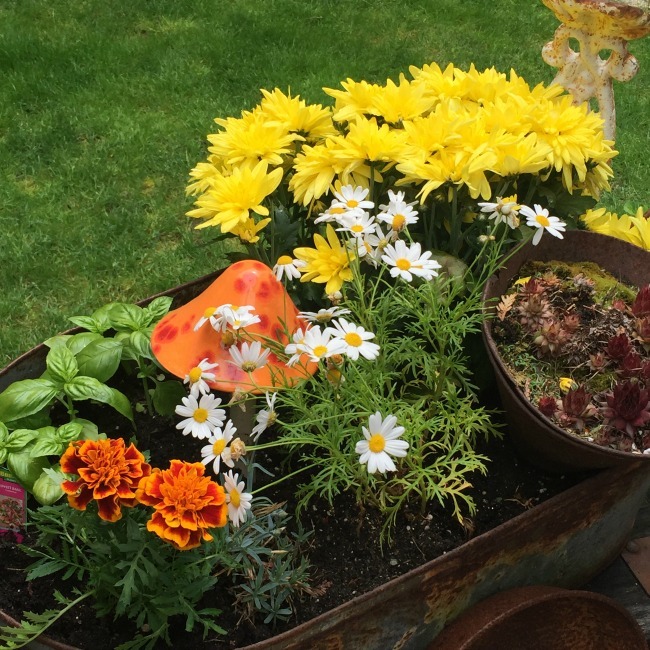 I'm looking forward to seeing all these containers and repurposed treasures filled with beautiful flowers very soon. 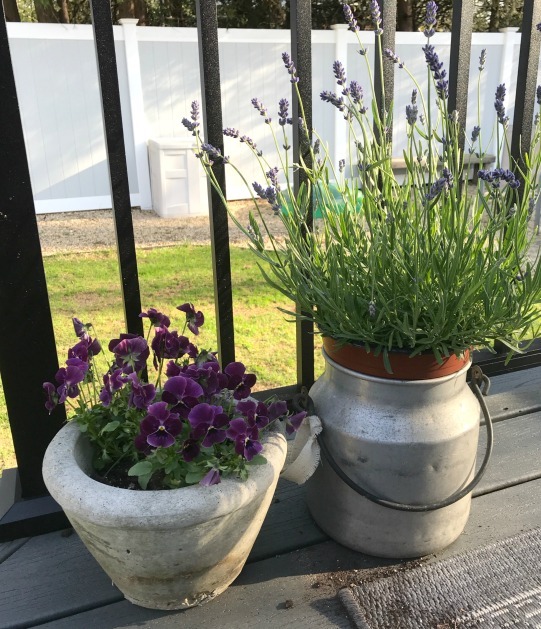 I'm using an old milk jug for my lavender this year. 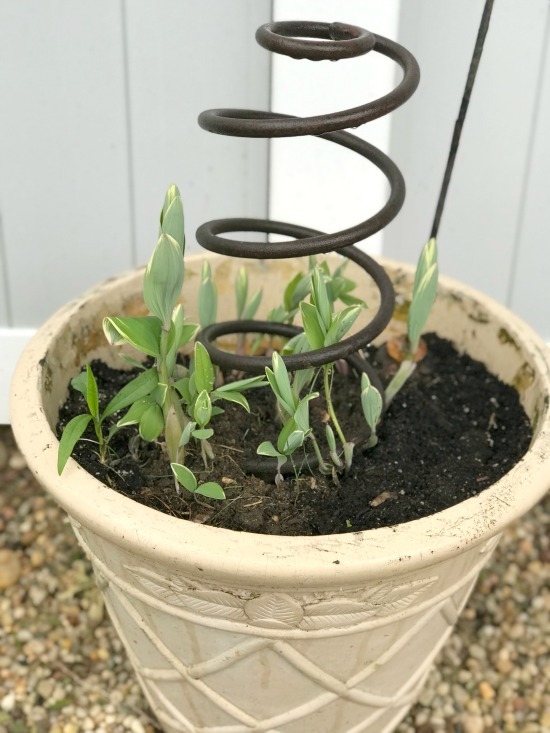 I'm having a big problem with squirrels digging in my pots this year as you can see from the dirt on the deck... anyone know how to keep those little buggers out of my pots? You can read about repainting the urns at our front door to match the shutters and update for a new season.